This week Hilda and I will be part of a panel, Historical Literature: Wisconsin Authors Open Portals to the Past, at the Wisconsin State Reading Association Convention. We look forward to sharing the love of books, reading, research, and writing with others. 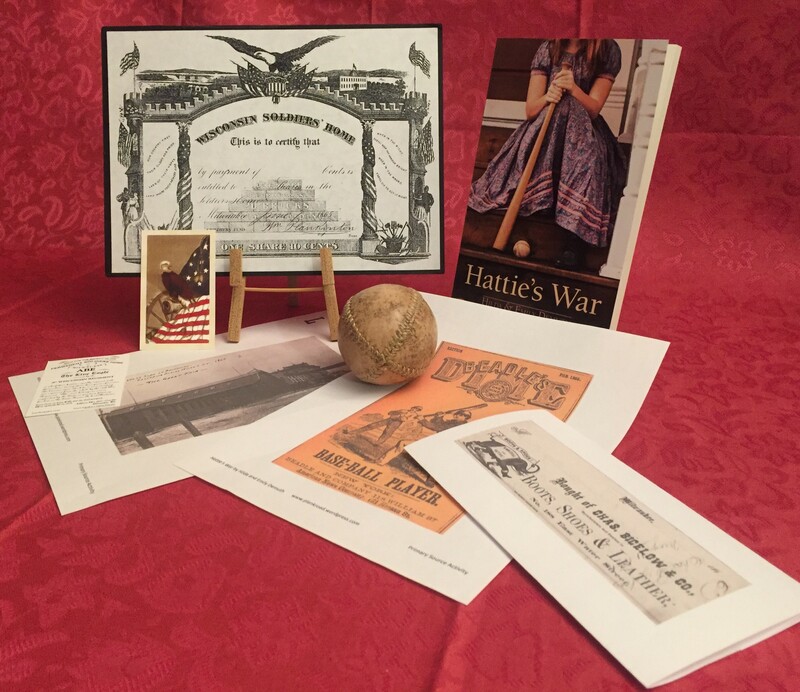 Use our new activity to explore primary sources with your students. As part of our preparation for this event, we have a new resource to share with our readers and teachers. We had developed a primary source activity to use on school visits. It involves matching primary sources that shaped our writing with pages from Hattie’s War. We have just uploaded a PDF of the activity on our “Resources for Teachers” page. We hope that it can be a valuable tool for your classroom. On Sunday, September 30, 1:00-4:00 pm, Emy and I look forward to welcoming the public along with old friends and neighbors at the Plank Road Winter launch party. The celebration will be held at the 4-H Clover Center, 17640 Old Yorkville Road, a few miles north of Union Grove,Wisconsin. This 1885 schoolhouse stands at the very heart of the original Yorkville settlement. 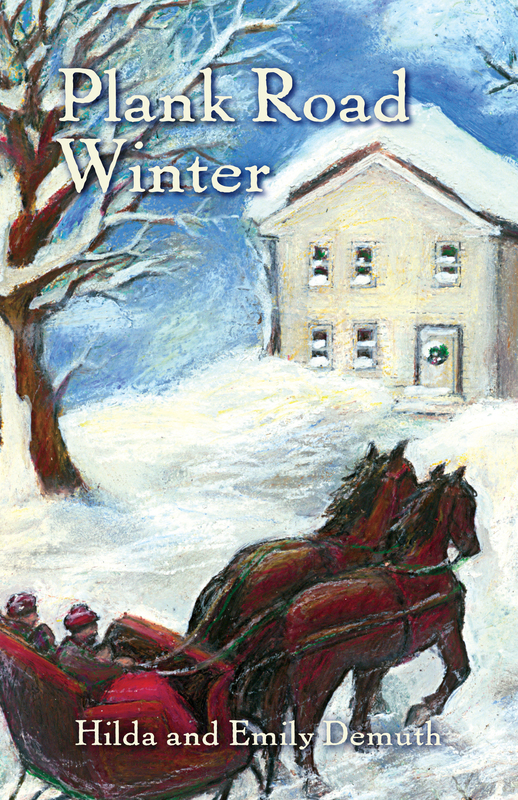 Set almost twenty years after the adventures of Katie and Florence, Plank Road Winter features thirteen-year-old Sophie Caswell, who longs to escape the dull farming community of Yorkville. Sophie’s plans are thwarted when the Chicago Fire leads to the arrival of twelve-year-old Hans Hoffman and his family at the nearby McEachron farm. While Sophie stubbornly pursues her dreams, Hans struggles to adapt to a world very different from his bustling Chicago neighborhood. In the spirit of nineteenth-century community gatherings, the entertainment at the Plank Road Winter launch party will include traditional music provided by John and Susan Nicholson of the Milwaukee band Frogwater and old-time dancing called by Patricia Lynch of the West Side Victorian Dancers. After celebrating Christmas and the New Year with our families, Hilda and I snuck away for a much-needed writers’ retreat. 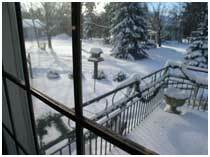 We escaped to Wisconsin, where we holed up for two nights at the Lawson House Bed & Breakfast in Hales Corners. The Lawson House could not have been a more perfect place to write. We learned that the house is located along what had once been the old Janesville Plank Road, which runs into Milwaukee. We enjoyed fabulous breakfasts and wonderful hospitality. The large front room with a fireplace and comfortable furniture allowed us to settle in for hours of reading our manuscript aloud, editing old chapters, drafting new ones, and laughing and crying together as sisters do. During breaks from our writing tasks, I leafed through various historical books scattered about the room. In one, I read about the Hales Corners Stock Fair that had taken place once a month from 1871-1958. This bit of local history actually wound up in our novel. 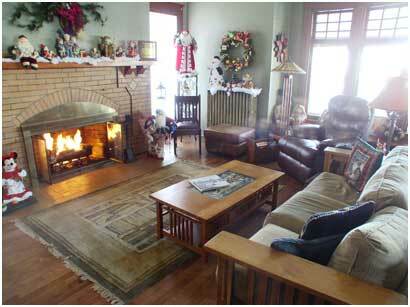 We left the Lawson House inspired and refreshed with a manuscript ready for our editor to see. This morning Patricia Lynch, Civil War dance instructor in Milwaukee and president of the West Side Soldiers Aid Society, emailed me a wonderful treasure–a PDF of a page from a dance tunebook used by Yorkville settlers in the plank road days. These figures are familiar to square dancers and contra dancers today. Old-time dance communities still flourish in the Midwest, following in the footsteps of the Yorkville settlers who promenaded in the Waite’s Corners schoolhouse or the ballroom of the Mather Inn. If you attend the Plank Road Summer book launch at Yorkville Elementary School (see the Events page), you can join in old-time dancing with caller Dot Kent and the Hoosier Recruits, a contra dance band. The Recruits may well be playing a dance or two out of the Waite family tunebook. Nine winters ago Emily and I were plugging away at our Plank Road book, snatching time from our families and other responsibilities–“sneaking away to write,” I called it. When we weren’t scribbling, we were daring to dream about what our summer would be like if I received a Lilly Teacher Creativity Fellowship. After much whooping and hollering we finalized our plans for the Plank Road Trip–a week of travel to historic sites with a Dickensian entourage (two authors, our mother, Emily’s husband Franklin, our sister Gretchen, and six children, ages four to ten) followed by a week of digging in archives and scribbling without the entourage (courtesy of Mom and Dad and Gretchen, who looked after the children while we snuck away to write). Many of Wisconsin’s best-known historic sites are relevant to Plank Road Summer: Wade House was an inn on a plank road, Pendarvis was settled by Cornish immigrants, and Milton House was an Underground Railroad station. The Scotch Settlement church building attended by the McEachrons now stands in Stonefield Village. The living history interpreters at Old World Wisconsin and other sites provided us wonderful details about daily life in pioneer households. “We’re the Demuth sisters — we’re writing a book.” That line opened doors and drawers and cupboards for us, as volunteers and staff members shared what they knew, eager to discuss the making of strawberry preserves or the threshing of wheat. Nine winters later, we are planning a reprise of the Plank Road Trip, this time to schedule book signings. At this point we don’t know whether our entourage will be quite as Dickensian, but we do know how much we owe to the volunteers and staff at historic sites who share our passion for the past.